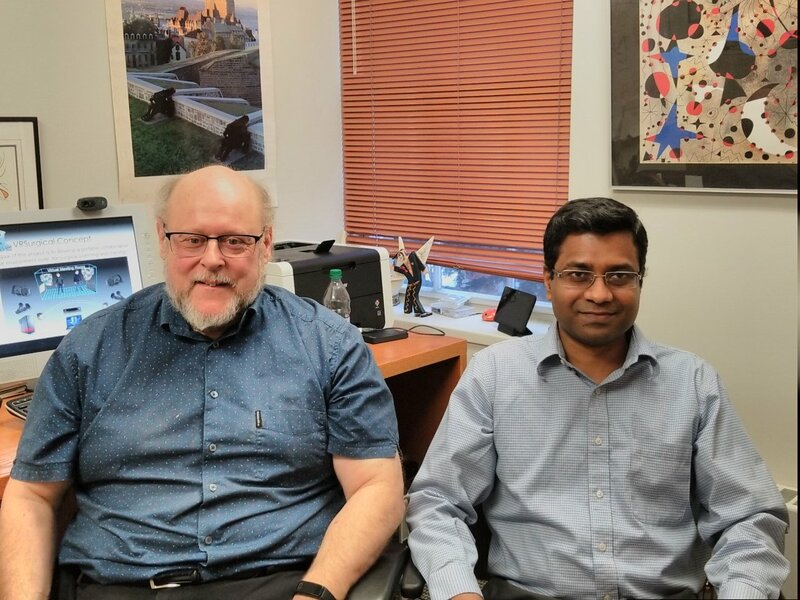 We are here today with Dr. Pierre Boulanger (Computer Sciences) and Dr. Kumar Punithakumar (Radiology) of the VR Surgical System to learn about their innovative VR technology for 3D surgical planning. In this interview the example shared applies to cardiac surgery and radiology teams. Their respective labs are located at the University of Alberta and the Mazankowski Heart Centre. Pierre and Kumar, why did you create the VR Surgical System prototype? Was there an unmet need in surgery and / or radiology? There is great need for surgeons and radiologists to communicate with each other about patient’s medical data such as CT, Ultrasound, PET, and MRI. These datasets are 3D and require new tools to take the full advantages of these fused images and data visualization. VR Surgical System simulates a meeting room where two or more participants can observe and process the data, render medical images with advanced volume rendering technologies, read patient’s reports and information, and plan a surgery. VR Surgical leverages networking technologies and advanced graphics to offer a complete virtual teleconferencing solution in 3D where participants at different locations can discuss and collaborate over the network. How does it compare with what is being developed? This solution is truly a step ahead of current technologies as it allows participants to observe medical images from various viewpoints, discuss over the net surgical procedure alternatives, and collaborate with another specialist where ever they are located on the planet. Can you explain future the value that VR Surgical System adds to the surgeon’s ability to achieve a higher rate of technical success? The key advantages of VR Surgical is that it allows medical teams to collaborate more efficiently and to improve surgical outcomes by being more prepared for a surgical procedure by increasing the situational awareness of the real patient’s condition, and to plan the surgery as a team. This capability allows surgical teams to plan with more accuracy as to what procedure will be used and for the tools and equipment required for the surgery. What initiatives are you focusing on in Edmonton and collaborating with others in Canada and globally? VR Surgical was designed to improve the capabilities of the SERVIER Virtual Cardiac Centre (SVCC) at the Mazankowski Heart Institute. Directed by Dr. Michelle Noga, the SVCC mission is to develop new clinical application of sensor fusion and data visualization for pediatric cardiac diagnosis and surgeries. Dr. Boulanger and Dr. Punithakumar, we look forward to Episode 2 for your take on the next 5 years and future goals for VR Surgical Systems. Pierre is currently the Director of the Advanced Man Machine Interface Laboratory (AMMI) as well as the Scientific Director of the SERVIER Virtual Cardiac Centre in the Mazankowski Heart Institute. In 2013, Dr. Boulanger was awarded the CISCO chair in healthcare solutions, a 10 years investment by CISCO systems in the development of new IT technologies for healthcare in Canada. Dr. Boulanger received his in Engineering Physics and his Masters in Physics Laval University, and his Ph.D. in Electrical Engineering from the University of Montreal. Dr. Boulanger cumulates more than 35 years of experience in 3D computer vision, rapid product development, and the applications of virtual reality systems to medicine and industrial manufacturing. Dr. Boulanger worked for 18 years at the National Research Council of Canada as a senior research officer where his primary research interest was in 3D computer vision, rapid product development, and virtualized reality systems. 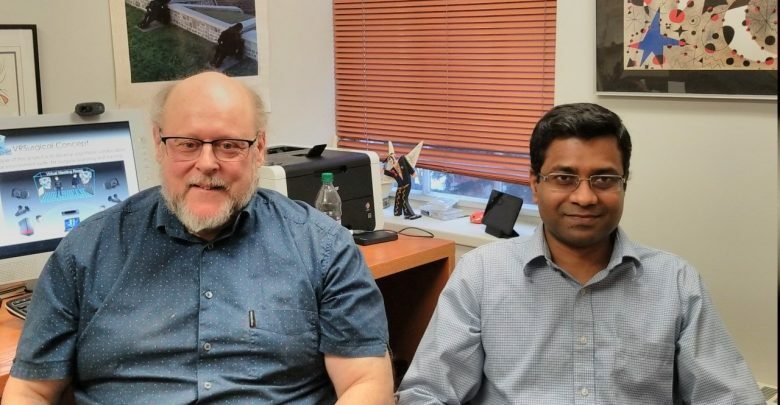 He now has a double appointment as a professor at the University of Alberta Department of Computing Science and at the Department of Radiology and Diagnostic Imaging. Kumar is currently the Operational and Computational Director of the SERVIER Virtual Cardiac Centre in the Maznakowski Heart Institute. Dr. Kumaradevan Punithakumar received the B.Sc.Eng. (with First class Hons.) degree in electronic and telecommunication engineering from the University of Moratuwa and the M.A.Sc and Ph.D. degrees in electrical and computer engineering from McMaster University. From 2008 to 2012, he was an Imaging Research Scientist at GE Healthcare, Canada. He was the recipient of the Industrial Research and Development Fellowship by the National Sciences and Engineering Research Council of Canada in 2008, and the GE Innovation award in 2009. Areas of interest include medical image analysis and visualization, information fusion, object tracking, and nonlinear filtering. Michelle is the Medical Director of the SVCC. Dr. Michelle Noga is a radiologist trained at University of Alberta and British Columbia’s Children’s and Women’s hospital. She is currently an associate professor at the University of Alberta, department of radiology and diagnostic imaging, and a radiologist with Medical Imaging Consultants. Areas of interest include pediatric cardiac MRI and CT, post-processing of cross-sectional cardiac imaging, 3D visualization, rapid prototyping, pediatric airway, and finite element analysis.